This week I was featured on Finnish media sites quite prominently. It all started when I gave an interview to the Finnish newspaper Aamulehti about how I invest for son’s future and how he could become a millionaire with just under 95€/month invested from birth until he turns 17. What makes that news worthy and even some what controversial is that it’s the exact amount every Finnish family gets as a child allowance benefit from the Finnish government. That is one of the few benefits that you can get no matter how much money you earn or how well off you are. We don’t actually need it to raise our child so what we have done is get it paid directly to our sons bank account and from there it goes to his investment account. Yes, I opened an investment account for my son right after he was born. One of the most important lesson about money I want to teach him is the wonder of compound interest. This is where the claim that you could make your child a millionaire before his retirement age comes from. 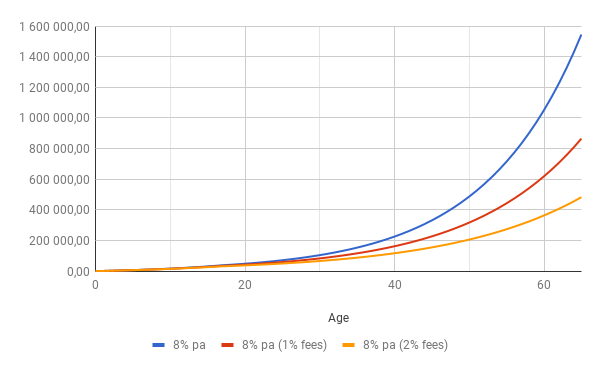 Let’s assume you invest 94,88€ per month from the time your child is born until he/she turns 17 and let’s assume you can get 8% annual interest on it. You also need to take into account fees so I’ve factored in 0,2% fee which what you would pay on a well diversified ETF. By the time your child is 18 you’ve accumulated 19 355,52€ as principal and the investment would be worth around 41 000€. So you’ve already doubled the invested amount. Now let’s say you manage to convince your child to leave that investment alone and they forget it until they are 61 years old. Now the investment value would have already surpassed one million mark and you still haven’t invested more that that 19 355,52€. That is the power of compound interest. Above I have graphed the same investment without fees and with 1% and 2% fee. It shows you how much fees actually matter on the long term even though 1% or 2% might not sound so much. So mind the fees you are paying for your investments. So where do you invest all that money? Well I’m not a certified financial planner but the advice I give people is listen to what Warren Buffett tells. He says the best investment for most people is passive index fund and the index he recommends is the S&P 500. It’s not just something he says there’s actually studies that show that most active traders loose the the index on long term. It’s the simplest and most fool proof way to get the average stock market return by doing that. Okay not quite fool proof because there is human element and that is you the investor. What you need to do is never ever sell it no matter how bad the market looks like as it will bounce back. 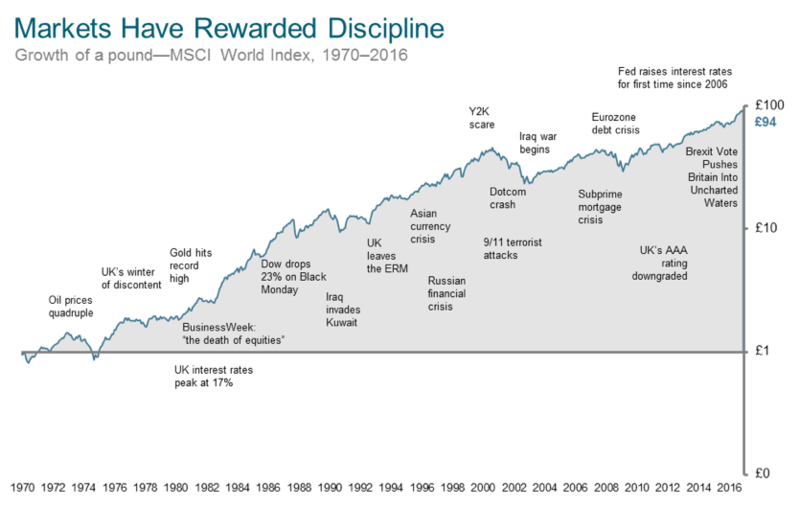 Just look at the MSCI World index from 1970 to 2016. There’s been quite a few crisis during that time but over the long term it’s gone up. So where to open an investment account? I’ve only invested while I was in USA and Finland so those are the two country where I can give recommendations. If you are in the USA open your investment account on Schwab. They don’t charge any fees on the account and they have a ton of low cost passive index ETFs. Another great place is Vanguard. Bear in mind that USA has Kiddie tax which is there to prevent parents from avoiding tax by stuffing their money to their children. So you need to investigate a bit how not to get hit by that tax. If you are in Finland the place I recommend is Nordnet. The reason is that they don’t charge fee for the account and they have ETF savings plan that automates the investing and doesn’t charge a fee for buying the ETFs. Kauppalehti – Miten aloitan lapselle säästämisen? This is not the first time I’m on headlines that’s because I write a personal finance blog in Finnish. It’s called “Matkalla vaurauteen” so directly translated Road to Wealth.